Line a baking sheet with parchment paper. Season the beef with black pepper. Heat the butter in a 10-inch skillet over medium heat. Add the mushrooms, shallots and garlic and season with black pepper. Cook until the mushrooms are tender, stirring often. Remove the mushroom mixture from the skillet and let cool. Sprinkle the work surface with the flour. Unfold the pastry sheets on the floured surface. Roll the pastry sheets into 2 (14-inch) squares. Trim the edges to form 2 (13-inch) squares. Cut each square into 4 squares, making 8 squares in all. Place 1 tablespoon Gorgonzola in the center of each pastry square. Divide the mushroom mixture evenly among the pastry squares. Top each with 1 filet mignon. Fold 2 opposite pastry corners over the beef, overlapping slightly, and press to seal. Brush with the egg. Repeat with the remaining pastry corners. Place the pastry-wrapped beef seam-side down on the prepared baking sheet. 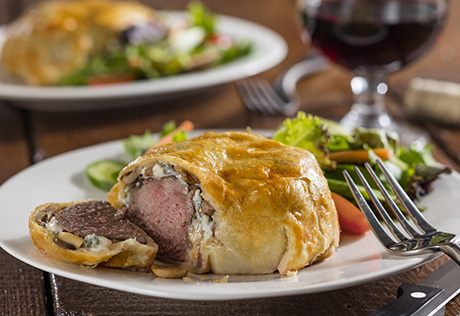 Cover and refrigerate the pastry-wrapped beef and the remaining egg for 1 hour or overnight. Heat the oven to 425°F. Brush the pastry-wrapped beef with the remaining egg. Bake for 20 minutes or until the pastry is golden brown and the temperature of the beef is 117°F. Serve immediately.